How level is this floor? In our industry, the flatness and levelness of a floor slab regularly become an issue that we argue about. Why? Because making repairs to a slab that is not flat or level can cost tens of thousands of dollars and delay construction progress. None of us want to hold progress, right? 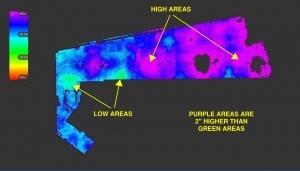 What if you were able to see with a high degree of accuracy the areas of a slab that were really not acceptable or simply just out of thedesired tolerance? We’ve made it easier for our clients to see how good or bad a slab “looks” by animating several thin cross-sections of our floor deviation report. This approach has helped our clients very simply pinpoint areas that they want to focus on. Additionally, we give them the tools to quantify how much leveling material would be needed to make repairs, ensuring their cost estimates are accurate. We are pleased to announce that we have purchased some really great pieces of technology to be able to offer reality capture services. Our Leica BLK360 laser scanner allows us to provide high resolution 360-degree imaging and point clouds. 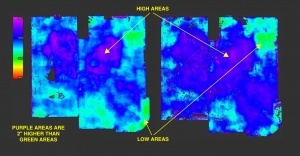 If you need a survey of an existing space or a floor deviation report, we can perform the reality capture scan for you. If you’re more of a DIY-er, you can rent our scanner and all necessary peripherals for $100 a day* and scan on your own! Call us today (484.402.6636) for a free quote, and let us reveal the value in better up-front planning through reality capture! *Insurance may be purchased at an additional rate. Reveal Consulting Services provides construction management and process improvement services to clients. With over fifteen years of retail and commercial construction experience, our goal is to lead the industry in leveraging innovative construction techniques as owner’s representatives. We have found that by effectively planning a project at the very early stages, clients can take advantage of lean construction methods, 3D building information modeling, and reality capture using LiDAR tools to reduce schedules and costs. Let us help your company reveal technologically advanced tools and the value in better up-front planning!